Lake County had a downpour last Friday and I was concerned about driving up to fish with Feral Saturday morning because the rivers up there flood so quickly. I didn’t have to worry. 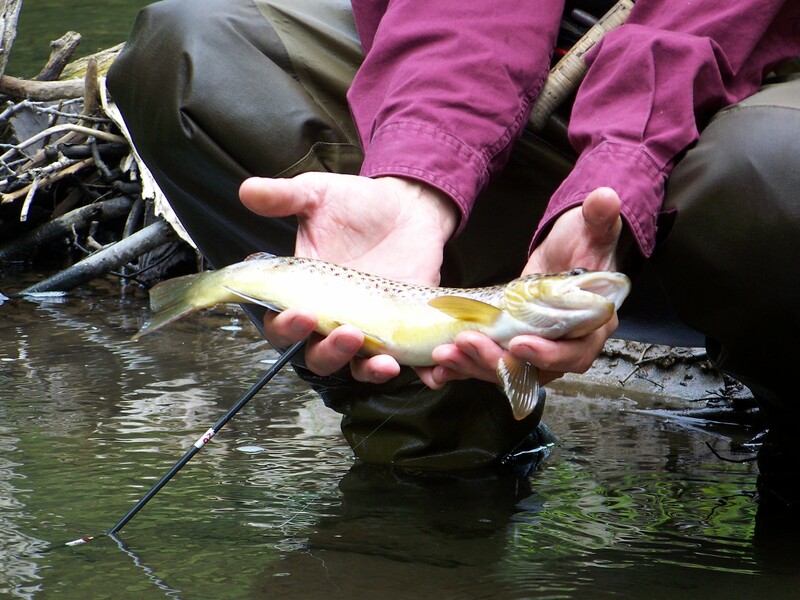 The downpour brought the rivers and streams back up to normal shallow depth which is to say – not so good for trout fishing. The water was clear. You couldn’t tell it rained. I don’t know what the streams looked like before the rain but I suspect we could have picked trout like mushrooms. 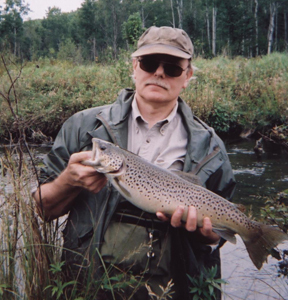 We fished a stretch of the Pine River and Feral caught the “summer trout” pictured above but that wasn’t enough to convince us to stick it out for long. Normally deep (and treacherous) holes were wadable – up to a point. I crossed the stream in a deep spot and could literally feel cold water pour in my waders around mid-navel. Good to know. I’ll have to dip them in the goop tank or buy new before fall when we do our “closer” up in Pigeon River country. Leaky waders in warm weather is one thing, in the fall it’s a curse. The one (other) surprise Saturday was someone (Trout Unlimited?) added some log structure intermittently throughout the river. It didn’t help our fishing but I suspect when the rivers rise the new cover will hold fish. I appreciate their efforts even though the Pine does a pretty good job on it’s own of carving out new fish holding spots. As a trout stream, the Pine is one of Michigan’s best naturally reproducing streams so tampering with it seems risky. I don’t know enough about stream biology to know if the work done to add fishing structure might not affect spawning areas but hope those who attempt to improve it fully understand they are tampering with mother nature. Most likely they are hoping to catch more “Summer Trout.” I can appreciate that. If someone were to suggest drift fishing for bass a week ago, I would be a little skeptical. If the intended bait was made of plastic I might roll my eyes. But that is where I found myself this week. My brother-in-law Bill keeps a johnboat up at his home on Silver Lake (the lake that abuts the sand dunes) and he invited his friend Mike V, and myself out one morning. The wind was straight out of the East which usually means tough fishing, and it coincided with a cold front, which usually means very tough fishing. It was like the perfect storm for no fish. Bill motored us upwind for the drift and set Mike up with a tube lure with split shot a foot up from the lure. Bill set up his pole with a purple worm which he modified by cutting off the curly tail, and hooking it dead center with a bait hook. They lobbed the baits over the side and we slow drifted in front of the cottages on the southwest corner of the lake. I decided to use the standard stuff – a texas rigged power worm, a spinner bait, and a pop-r, all old standbys, rather than try the drift fishing. 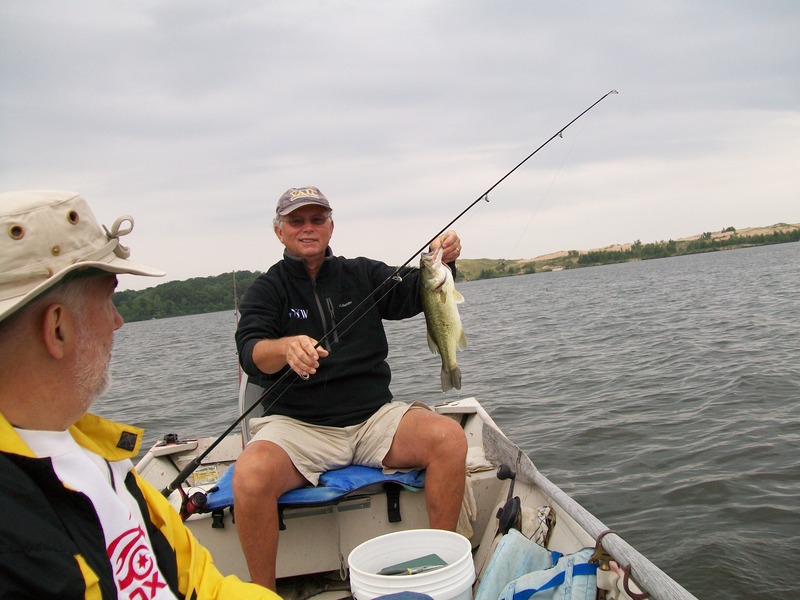 So I was casting like mad, blindly, when Mike hauled in the first bass, a chunky 2-1/2 pounder. Bill was next and lost a nice fish right at the boat. Meanwhile I started reconsidering just what the heck they were doing. Two fish for one short drift – not bad! Bill dropped anchor in front of some reeds on the west end of the lake and said it was a good spot. We worked that area a bit and I caught one on a power worm, then we worked along the west shore and all caught bass. I picked up a nice one on a white spinner bait, semi hoping I might just catch a big pike or maybe even a walleye. 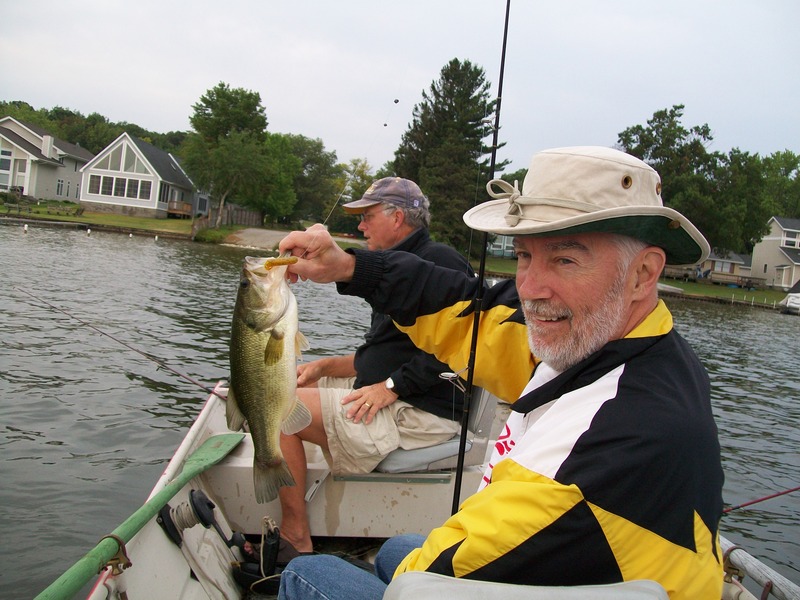 We decided to do another drift and Mike and Bill both caught bass again during the drift. There is no question now about whether it makes sense – with the right lures, particularly tube lures, drift fishing for bass is viable option. It helps that Silver lake is a great fishery with a lot of bass but I credit Bill for coming up with such a productive fishing technique. I plan to try that on some other lakes when the fishing gets tough.